I tried a YUMMY new shrimp recipe tonight! My husband is out of town for work travel (he hates seafood) so I get to try new seafood recipes every once in awhile! This one came from the Steamy Kitchen and reminded me of a PF Chang’s recipe I love so much! This one was really easy to make…almost too easy to make. This one is Gluten free (make sure your soy sauce is Gluten free and read your label on the oyster sauce). I paired this with brown rice, threw in some sugar snap peas and broccoli and it turned out great! In a wok or large saute pan over high heat, add half the olive oil and swirl to coat the bottom of the pan. When the wok is very hot, add the shrimp in a single layer and cook partially until one side is seared brown, about 1 minute. Flip and sear the other side of each shrimp, about one more minute. They don’t need to be cooked all the way through yet. Remove them to a plate or bowl and set aside. Turn the heat down to medium and let wok cool off a bit to prevent the aromatics from burning. Add the remaining olive oil and add green onion, garlic and ginger and stir fry for a minute until fragrant. Pour in the sauce mixture and add the shrimp back into the pan. Stir fry for another minute until shrimp is cooked through. 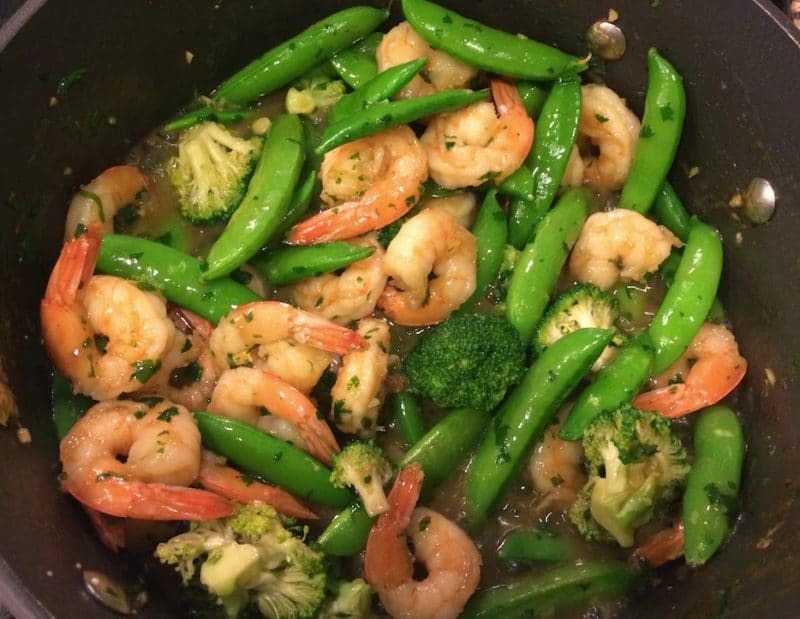 Add your sugar snap peas and broccoli and stir fry for about 3 to 5 minuted.